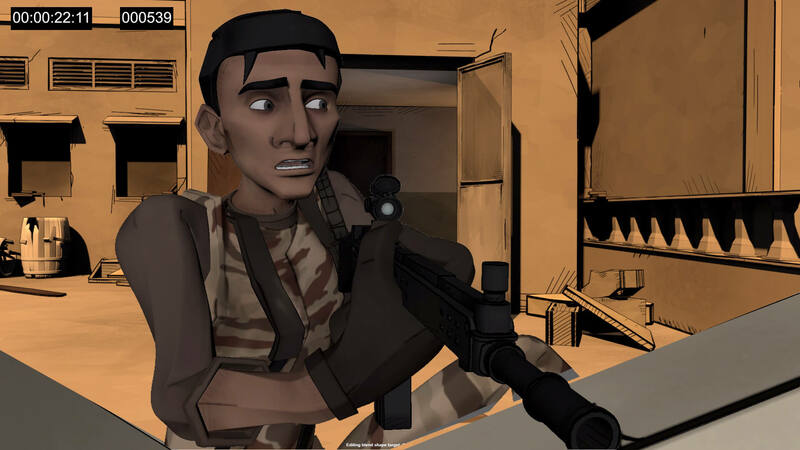 Create Assets, Sequences and Shots. Start from empty or existing scenes and let Prism handle the filelocation and the filename. A new version of a scenefile can be saved with a single click and comments let you identify your scenes. You can export specific objects or complete scenes and import it in any other scenes. 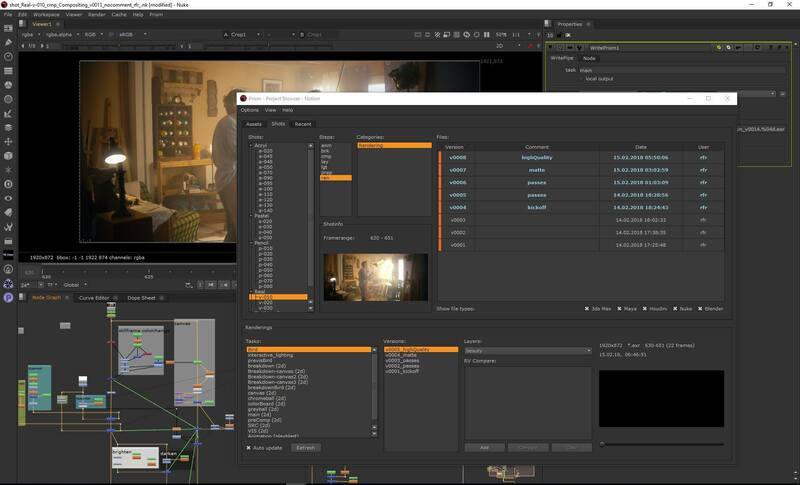 You can export assets in order to use it in shotscenes in the same software or import it in any other software supported by Prism. You don’t need to deal with complex export settings. Exchanging data between scenes works with just a few clicks. Prism handles most settings automatically, but lets you override them if needed. Working with different programs often means you have to deal with different units and scales. Prism knows which units to use and takes care of this problem for you. Alemic (.abc), .fbx, obj, bgeo and more. 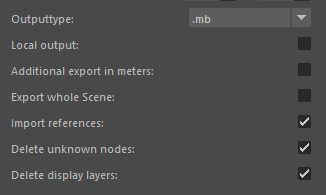 For Maya, Max and Blender referencing and merging of other scenes is possible. For Houdini exporting and importing of .hda files gives you many possibilities. Create playblasts and save them to your project folder. Compare them, share them with your team to decide on the best version. 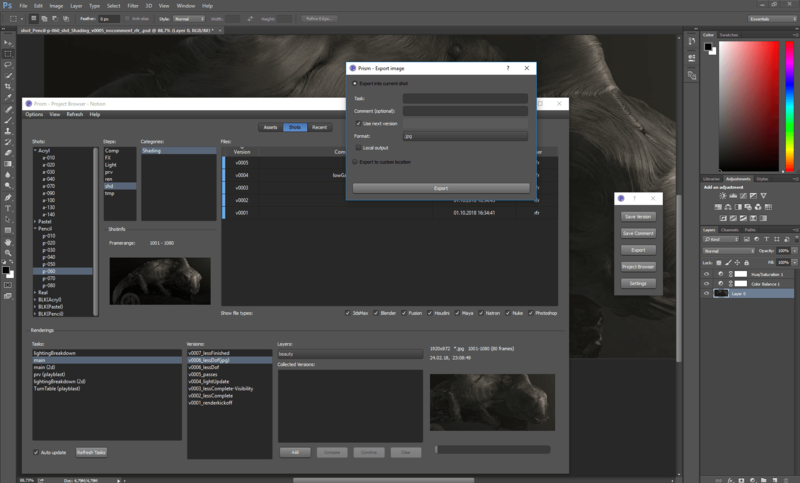 Prism handles your renderings including general render settings, filenames and renderpasses. In Houdini Mantra and Redshift are supported. In other softwares you are not limited to any renderer. You can render on your local PC or submit a renderjob to Deadline or Pandora. Browse your different versions of renderings, playblasts or external media files. Compare them in RV and play them in sequence or in any other media player. You can automatically convert your media to different file types. For example to create proxy .jpgs from your renderings or a video file from image sequences. Prism lets you work on multiple projects at the same time. You can always create a new project and switch back and forth between your recent projects. From the menu bar of most tools you can open a list of your recent projects and switch them immediatly. If you have a Shotgun account you can use the Shotgun integration for Prism. This lets you synchronize your assets and shots and publish your playblasts/renderings directly to Shotgun. Prism comes with a complete Houdini shelf to access all Prism tools easily. All Houdini license versions are supported including the free Houdini apprentice. Prism manages your scenefiles (.hip, .hiplc, .hipnc) and handles all export/import nodes for you. In the SOP context there is also a node called “PrismTmpCache”, which lets you save a cache with one click. 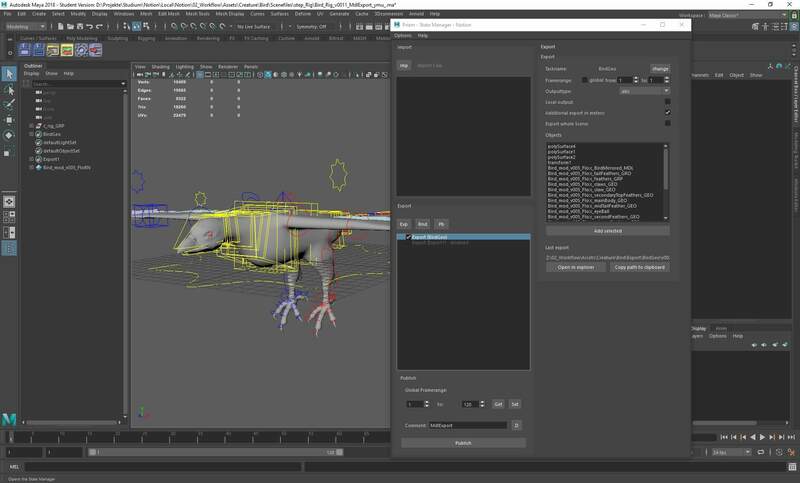 Prism has its own shelf in Maya to access all Prism tools. 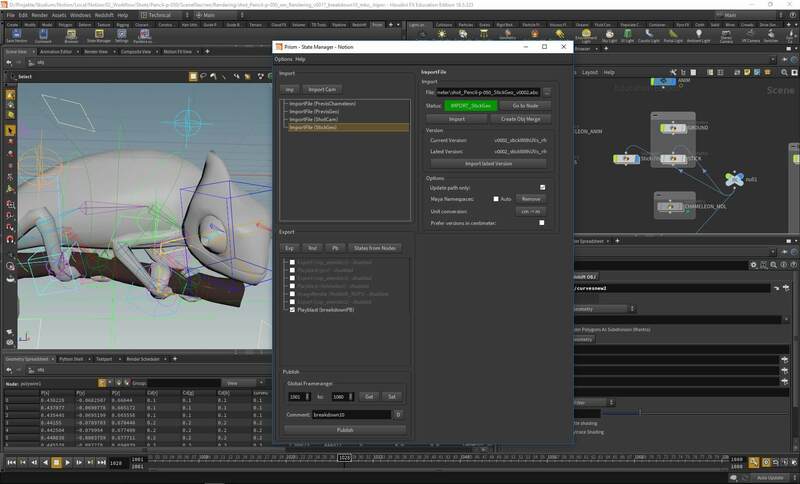 Maya specific features like references, render layers or Arnold renderpasses are supported. 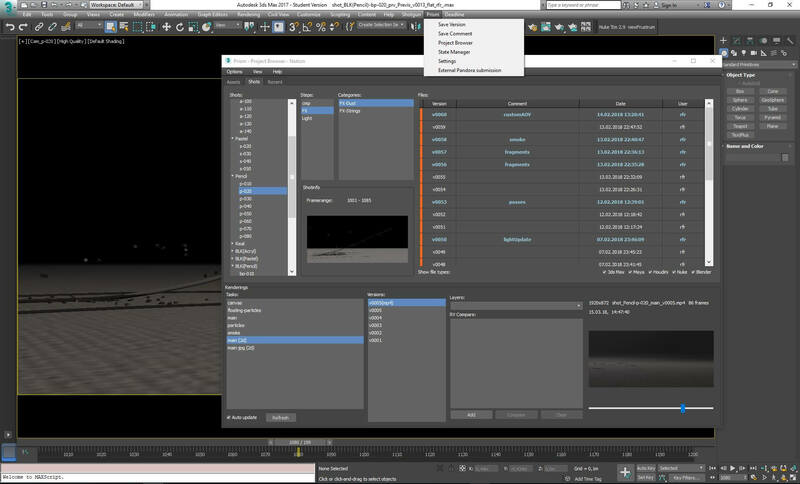 In 3ds Max Prism is available from the main menu bar. Prism supports XRefs and has overrides for basic VRay settings. 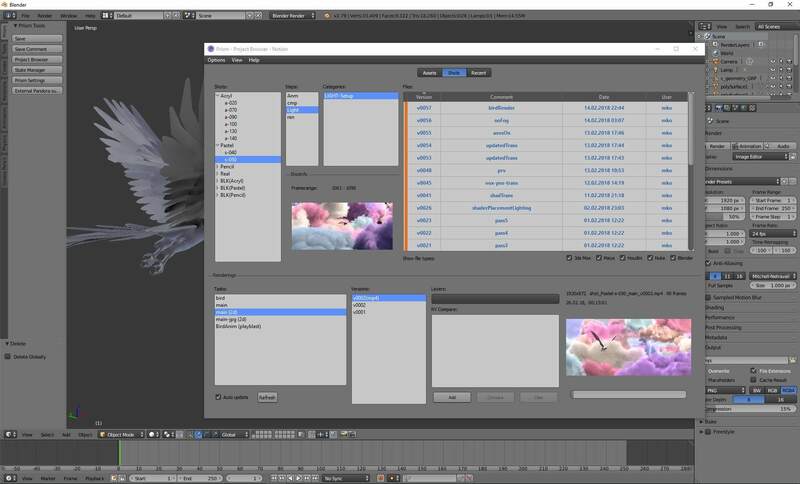 In Blender there is a Prism tab at the top-left of the user interface, which provides access to all Prism tools. You can enable the autosave feature for renderings. This will save every test render you make to a location, which you can define. The Nuke integration of Prism is available from the main menu bar. Additionally there is a “WritePrism” node, which automatically handles the outputpath for you. In the ProjectBrowser tool you can navigate to an existing rendering, import it to your current nuke script and generate a default layout with all render passes. Additionally to the main 3d/2d applications, Prism works closely together with other tools to optimize your workflow. These include RV, DJV, VLC for media playback, Deadline and Pandora for Renderfarm submissions and Shotgun for project tracking. All these additional tools are optional. You don’t need any external tool in order to use Prism. Support for other software packages is possible in the future depending on user requests. 3rd party developers can develop custom plugins, which add support for more DCC apps and which are compatible with the official Prism version. 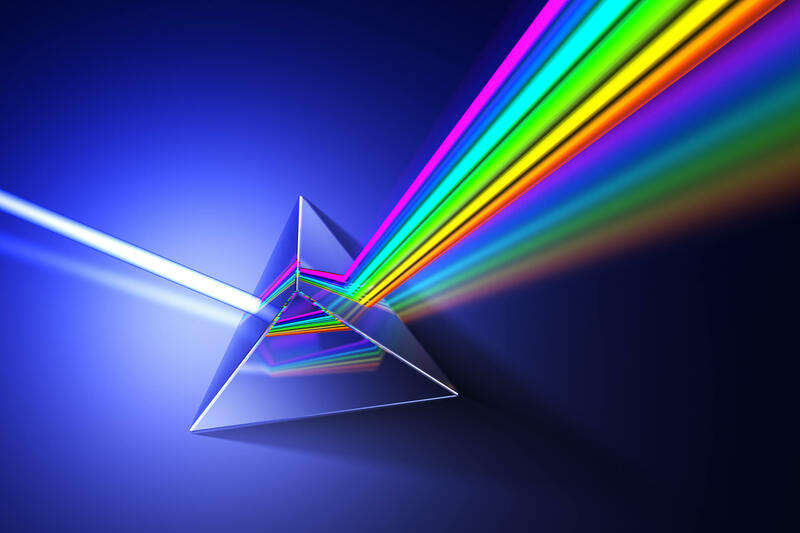 Previous to version 1.1.0 Prism was available only on Windows. Now Linux and MacOSX are supported, but note that currently some DCC app integrations are supported on Windows only. 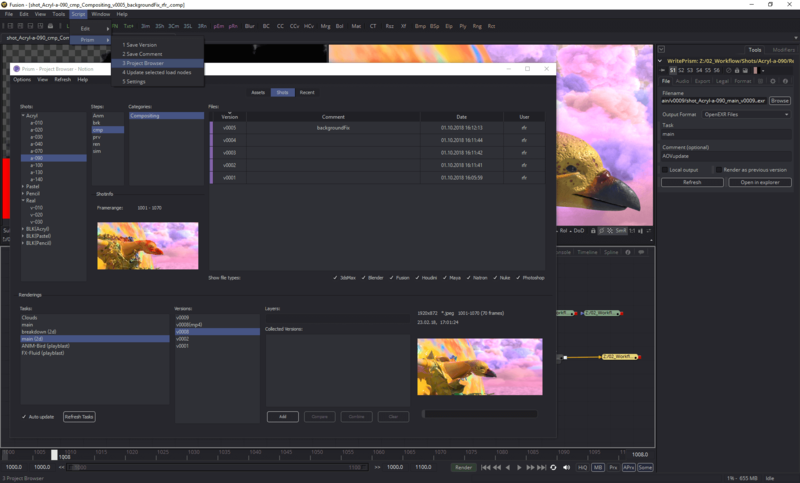 Prism can be integrated into Fusion, Natron and Photshop now, which allows you to use the tools seamlessly within your Prism projects. In version 1.1.0 Prism was restructured internally to make the development of new features easier. With the new “Plugin-Structure” it is possible for 3rd party developers to develop plugins, which add support for new DCC aps and can be added to the official Prism version. 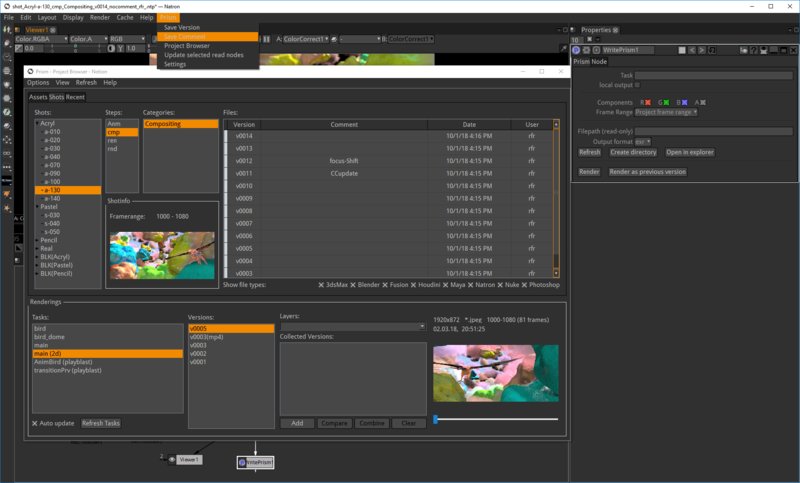 Combine multiple media sources like .exr sequences or .mp4 videos to one single video file. This allows you to watch multiple shots in sequence without the tedious use of an editing program. 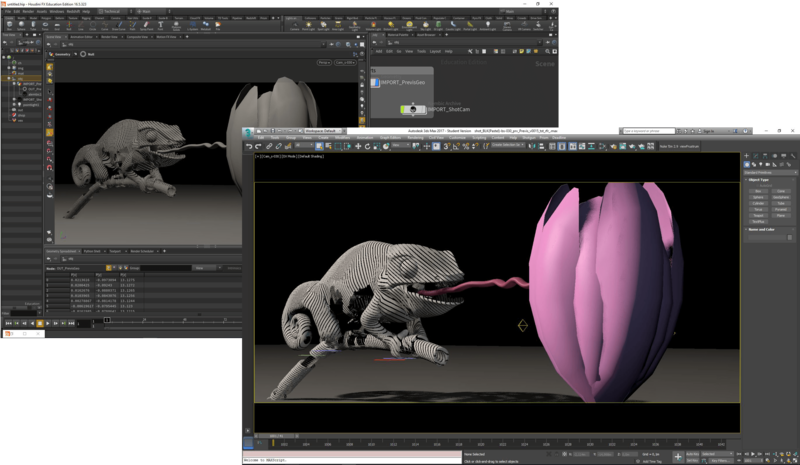 Prism now supports maya renderlayers. Exports can now be saved in the .mb format. Prism supports now the use of the filecache node and the “Geometry” and “Alembic” node in the OUT context. A new experimental high DPI mode can be used, when the Houdini UI uses the high DPI mode.